Midlifewanderlust1965 is dead, long live Midlifewanderlust1965! Midlifewanderlust1965 is dead, long live Midlifewanderlust1965 seems a dramatic title. However, there is some truth with it. The end of January say the end of midlifewanderlust1965.com. I chose not carry with the hosting agreement and allowed the blog to die a natural. All those posts no longer exist. Why did this happen? In truth, 2015 was a memorable year. I started my new job. Three months into the job my contract was transferred. I am now a civil servant. I also turned 50 and I seemed comfortable with this. All in all life was feeling good. However, 2015 was the year I did not travel. This is not good when you have a travel blog. Also my creative juices and inspiration were missing. I had stopped reading other blogs and using social media. Without realising I had taken a digital break. With the loss of the blog I thought this would bring the end of my midlifewanderlust. I was happy in my job. I had also been volunteering four hours a week at my local Oxfam store. Their values pretty much match mine and I feel that I am giving back. After much deliberation I decided to grow a beard. At my age I have gone past caring on how people think I look. There have been two reasons why I have decided to restart the blog. First is medical. Towards the end of last year I had been suffering pain in my left knee. It felt worse after exercise and after Christmas was starting to affect my movement. I have arthritis in the knee. The way I have walked over the years has worn out the joint. Thoughts came flooding back on how my mother allowed arthritis to take over her life. I was determined not to allow this to happen. So I have joined a gym on the advice of my physio in order to build up the muscle in my knee. Secondly, I had been watching ‘David Baddiel On the Silk Road‘ on the Discovery channel. The interesting stories and stunning camerawork brought back my wanderlust. I knew I needed to get the backpack out of retirement. I have booked my next trip for the end of September, location I will share in a future post. As I am going to travelling I felt it would be good to resurrect the blog and the name. What next for the blog? It is going back to being a hobby. I am lucky that I work five days a week having the weekends off. This will give me plenty of future travel time. I will start again Travel Blog Success. But, it will be completed at my pace allowing a lesson to be completed once a week. I will also start adding post from previous travels. So, I am back blogging. Midlifewanderlust1965 is dead, long live Midlifewanderlust1965. The blog was busy last month, as it always feels at the end of the year. As far as travel plans for January it will be quiet. I have to pay for Christmas and dental work. (Ouch!) This does not mean I cannot plan for 2014 and I will be announcing my travel plans for 2014 shortly. Until the next post have a safe, healthy and smiling 2014. October was another quiet month for the blog. I suppose I was getting over the trip and I just needed the rest. It was good to take a break and work on myself. Been looking on a diet and started exercising. So far managed to lose 9lbs. I am in the process of putting together more posts. November will also see me decide where my travels will take me in 2014. September was quiet in regards to posts. This was because I was on my travels. I returned home on Monday with plenty of photos and posts that I will like to share with you. Naturally, I have no plans for any travel in October. When Does Blogging Stop Being Fun? It has been interesting to read the various blog posts about last weekends TBEX conference held in Toronto. There were a lot of comments saying how enjoyable the weekend was. I had to admit that I looked on with some jealously as I would have like the chance to attend. However, amongst the comments I read there were some negatives. They were saying that TBEX had become too big and corporate and it was no longer for them. This brings me to the point of the post, when does blogging stop being fun. When we first set up our blogs it is initially to tell out tales. However, most blogs fail within twelve months due to various reasons. The dream is to be able to make money from the blog. There are many resources out there to help make this dream come true. The reality is somewhat different. It takes a lot of hard work to maintain a bog to that level. Saying that, it is still my dream but I will know that it will take time. One of the reasons we want to start a blog and make money is so to escape the corporate life. This is especially true of travel bloggers. The idea of getting paid to travel is appealing and is something many people aspire to. Yet working for yourself will mean that you will stay in the corporate world. The difference is that you are the boss. As I see it all TBEX is trying to do is help the aspiring travel blogger make their blog a success and make their dreams come true. My Grandad used to say if you are no longer enjoying something then stop. So if running a blog is becoming a chore and you no longer enjoying it then stop. It is a simple as that. Plenty of established bloggers have done so. There is no shame in stopping and I do not see it as a sign of failure. It is better to have tried than doing nothing. At this moment I enjoy working on my blog. Yes, it will never be the most read but I enjoying putting in the work. When I stop enjoying I will stop and you will be the first to know. June is going to be a quiet month. I will celebrate another birthday on the 12th. Apart from that it will be saving for September. I have been a member of Pinterest for nearly nine months. Would have to admit that I first struggled with the concept initially, but my confidence grew the more I got involved. What I love about Pinterest is the ease of being able to create your own boards according to your hobbies and interests. Also I love the way you can pin images onto your boards. This is a bonus and a great way of sharing to everybody. As you may gather the main interest in my life is travel and that is what I mostly blog about. Pinterest allows me to showcase great photography from other travel bloggers. I have put these together on a board called 'Great Pictures'. Well any photos look a lot better than mine. You will probably be able to spot them. Pinterest is fast becoming an essential tool for bloggers. This is why it is so exciting to see it launch in the UK. I also feel honoured and humbled to be asked to contribute to the birth of something that I know will become massive. Finally I would implore you to spread the word about Pinterest. After all one image can say more than a thousand words. Until the next post, stay safe, stay healthy and keep pinning. As titled the blog has reached another milestone. I have now have 100 followers. Some might see this as no big deal. For me it feels tremendous. When you first start a blog there is a amount of trepidation on whether anybody will read it. After all there are a lot of blogs on the web and the fact that people take time out to read mine gives me the motivation to carry on. So I move on towards getting the next 100 followers. I will continue to write on things that are of interest to me and hopefully for you too. 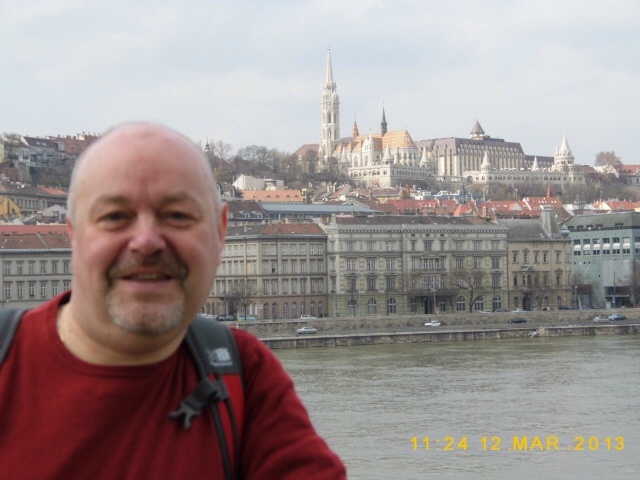 I leave you with a photo of me from my recent trip to Budapest. My plans for May to go on a couple of day trips to Manchester and London. Apart from that nothing much but saving.